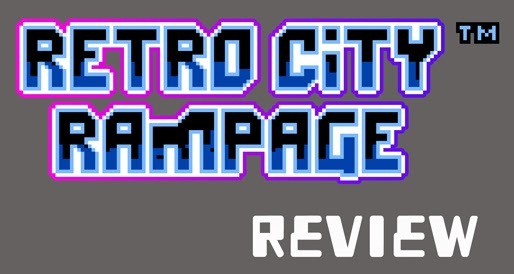 Retro City Rampage DX was recently released on the 3DS e-shop, so I revisited this throwback to NES era goodness to see how this newest version held up to the others. For the most part, the DX is the same as the other versions. The graphics are still 8-bit and awesome and the soundtrack is still retro and well done. They did add some new screen filters, which is great because I really liked those in the Xbox 360 and PS3 versions. Mostly, I'll talk about the changes and how this version stacks up to the others. If you are interested in more of the game systems, story and things, start with my reviews of the PS3/Vita and Xbox 360 versions. First up, the lower screen now houses a mini map. This is very, very useful. Previously, I would frequently pause to make sure I was taking the right roads while getting to my destinations. This new function makes it easier to get around the map, even if I frequently crash while looking at it (thankfully I don't do that in real life). Another awesome use of the bottom screen is weapon selection. Tapping the weapon will bring up the list of available weapons so you can quickly switch to the one you want. Second, the arcade challenges have been reworked to be more "concise". Basically, the time limit was cut in half and the scores changed accordingly. This change is ok, it doesn't really make them easier but makes it easier to replay them. I still found several challenges hard, but at least my failures took less of my time. Plus, there were also a few tweaks to some of the missions, to make them a little more streamlined, and the arcade games were also reworked. A third change is to the shooting. Now you can jump while shooting, effectively skipping part of the animation. This is essential for saving your health. Before, you had to wait a bit after shooting before you could jump, but not anymore. Unfortunately, because of the lack of a second analog stick, shooting must be done with the lock-on (Y Button). I always found this inferior to the second stick, as it makes the game harder. Sadly, there is no support for the Circle Pad Pro accessory, but I wouldn't be able to use one even if there was (since I don't have one). The last major change was to the game's camera. While driving, it will shift toward the direction you are going so you can see more of the screen. Since the DS screen is smaller than consoles or the Vita, this is very helpful so you don't crash. I didn't have any problems with the view while playing the game on the 3DS, so this change was good, even if not immediately obvious. The mini map and weapon selection on the bottom screen is very useful and a great advantage this version has over its predecessors. However, the easy way to shoot is now gone, making the 3DS version harder and more frustrating. Overall, is the game still good? Yes. Is it better than the previous ones? Not really. I'd recommend Retro City Rampage DX if you don't have access to the other systems. As much as I like the game, I feel the console versions are better, or the Vita version if you want to take the game on the go. Danganronpa: Trigger Happy Havoc is a Vita port of a PSP game with some enhanced controls (mainly you can use the touch screen). Since the PSP version didn't make it to the US shores, this will be most people's first exposure to the series. The premise is fifteen high school students enter into a prestigious school, Hope's Peak Academy, which only accepts students that are the best at what they do. Soon, they become trapped in the school and must enter a deadly game: kill another and get away with it or be trapped forever in the school. The art style of the game is unique. There isn't much motion, but the character designs look good and you can tell all the characters apart. When moving around, characters and other various objects are flat and placed above the environment, almost like cardboard cut-outs. While some may not like it, I do, as it is very unique and sets it apart visually from other games. You can also unlock the various pictures used throughout the game and character concept art. Also, I should note that the blood is pink... not sure why that is. Well, the fresh stuff, anyway. Dried blood is still dark red. While the game is very text heavy, there are actual voices for the characters. Most lines are not voiced, but many start with the character saying a phrase or some other thing. It's enough that gives you the impression they are talking without having every line voiced. However, the trials are almost all voiced, which is cool. The characters all have different voices and perform well, which is a bonus considering the range some of the characters have. The music is also good, as it is unsettling during many parts and fits the mood of each scene. The game is split into chapters, and each chapter into three parts. The first part is Daily Life, where you go about your business, making the best of the situation. When you have Free Time, you can pick another student to spend time with and strengthen your bond with them. You can also opt to give them a present, which, if they like, will increase their friendship. When you increase the friendship level, you will get another page of their Report Card and either a skill or an increase in SP. Both of those are used in the Trials, which I will talk about soon. It's very worth your while to spend your Kuma Coins on presents to give the others, as the skills help out a lot in the trial sections. It can be a pain to get good presents out of the machine (since it's random), but you get a fair amount of coins from trials so it shouldn't be much of an issue. The second part of a chapter is Deadly Life, where you must investigate to find out the who and how of each murder. The investigations are very interesting, and filled with enough information that you can actually figure out what happened. This will lead into the third part, Class Trial, where evidence must be presented and refuted quickly in order to reach the truth. The trials are more fast paced than I would have initially though. Lines move forward in real time, since they are voiced, and your counter to certain statements must be aimed to actually have an effect. It sounds strange on paper, but the concept is well executed. Each new concept is introduced one at a time, so you have some time to get used to each element before you have to combine them all to win. Besides just refuting claims and presenting evidence, you will sometimes have to enter Bullet Time Battles (yes, they are really called that). These are basically a showdown between your character and another, where you must shoot down their arguments in a rhythm-based minigame. They are actually pretty fun. However, my favorite part is the very end. At the climax of the trial, you help reconstruct how it played out by placing scenes in a manga that shows the crime. It looks really neat, even though it was sometimes frustrating to figure out what the small icon was representing. All of the trial sections are timed, so you really have to pay attention and act fast. There were several times I passed by the phrase I needed, so I had to wait until it cycled back, since there is no rewind unfortunately. I'm not going to talk about the plot, since I don't want to ruin it for anyone, but it's good. The mystery of what's going on and who has done what kept me hooked. During Daily Life, I would anxiously await for the murder to take place and poke around for Kuma Coins. Once the murder happened, I was absorbed in the game and wanted to play the rest of the chapter until its satisfying conclusion. The plot as a whole was also really good and I enjoyed it. Admittedly, I figured out most plot elements before they happened...maybe I'm psychic. Nah, it's probably just good intuition. The characters in the game are very different from each other and complex, so it's worth paying attention to all the details and interacting with them. Unfortunately, the only real reasons to replay the game are to experience the story again, or get the rest of the trophies. Speaking of trophies, you can't get them all in one run through the story. Fortunately, after completion you will open up an extra mode that will allow you to clean up the rest of them, which is pretty nice. You'll get a trophy after each chapter, and one for each character's filled out Report Card. One other note, when it says "every class trial" in the description, it just means all sections of one trial. So the gold for taking no damage becomes much easier. It's not a hard platinum, but will require a bit of time (or luck for the items). If you enjoy murder mysterious or games with very engaging plots then definitely play Danganronpa. I very much enjoyed the story and characters, and the trials at the end of each chapter were entertaining, if sometimes frustrating. It took me maybe 12 or so hours to make it through the game. The game was hard to put down, and thankfully the extra mode unlocked at the end gives you more time to play if you aren't ready to leave the game world. Random note: I was surprised when one character used the phrase "for serious". There's only one other person I've ever heard use it...me.